We have a few labels put out in our garden to help children identify some of the plants growing in the outer environment. Little wooden strips painted and mounted on wooden stakes, thrust into the ground. But like most things these labels have come to have many uses. In the past few months, we have had 3 children from the primary environment discover reading through them! A stroll in the garden, has witnessed them sound out each letter on the label and discover that they can read! A couple of days ago, a child pulled out a label from the earth. 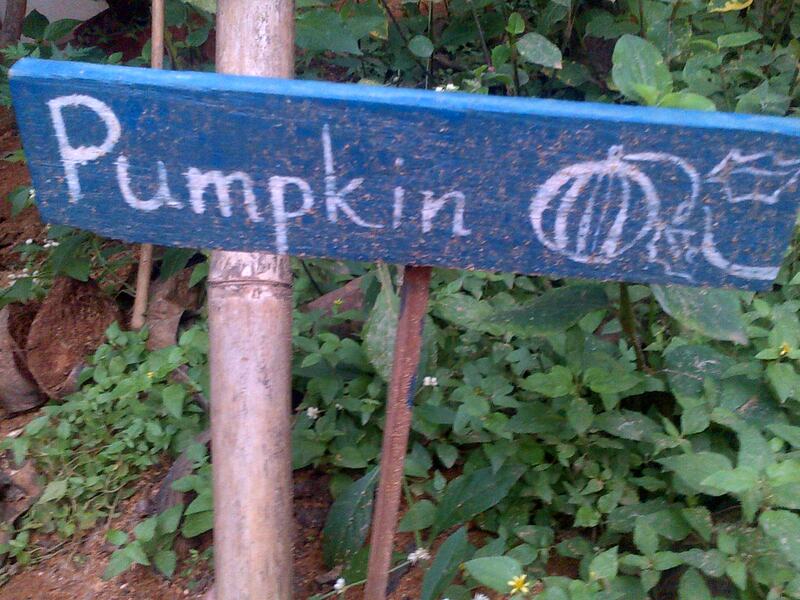 Upon being requested to place it back, he obliged but only after he sounded each letter and realised that the label said, ‘pumpkin’! You can imagine his delight. After that hand in hand with an adult he went to every label and read it, his grin getting broader and broader. Working with children it is all about ‘teachable’ moments and sometimes they are hard to miss! 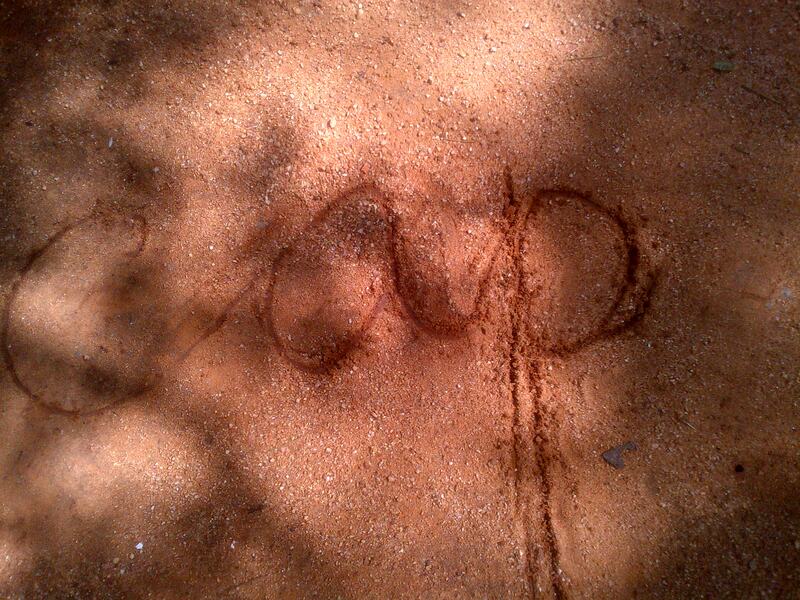 We sat down on the ground, still damp after a recent spell of rains, and with a stick I carefully wrote out a word. He read it, though ‘devoured’ is more like how it was taken. The next thing we knew we were surrounded by a group of children, all wanting a ‘word’ for themselves! There were several beginning readers, as well as children who had not yet discovered reading for themselves. Each one got a word. The readers read the words for the non-readers, while the latter carefully observed, as their friends de-coded the squiggles in the mud. Over and over again, the children shouted in excitement, “I want to read” , “Give me a word”, “Write ‘nutella’ for me” and it went on and on! So how does this happen? How do children ‘discover’ reading, rather than being ‘taught’ reading? Any note on reading cannot begin without a mention of the child’s sensitivity to language between birth to 6 years. A child passes through special times in her life when she easily incorporates a particular ability into her schema if allowed to practice it exhaustively during this time. Montessori called the unique sensitivities of young children ‘sensitive periods’. Her understanding of sensitive periods has now been confirmed by modern science and even popular culture, with Time magazine calling it ‘windows of opportunity’. The child ages birth to six years old passes through three significant sensitive periods; those for order, movement and language. Reading in the Montessori method, is a synthesis of many individual strands that a child ties together for herself. All through their time in the primary Montessori environment, children are given the tools to build a rich and precise vocabulary. The environment itself is one in which a love for language should be in the ‘air’. Good quality poetry and books should be read to the children and made available in the reading corner. A love and respect for books should be modelled by the adults. Children imbibe the left to right orientation required for reading, through engagement with the exercises of practical life. As they spoon grain from one container to another, pour water from a jug into wee glasses and cups, prepare their places to make dough or flower arrangements, they not only gain in independence but in effect are working on the left to right orientation required for reading. 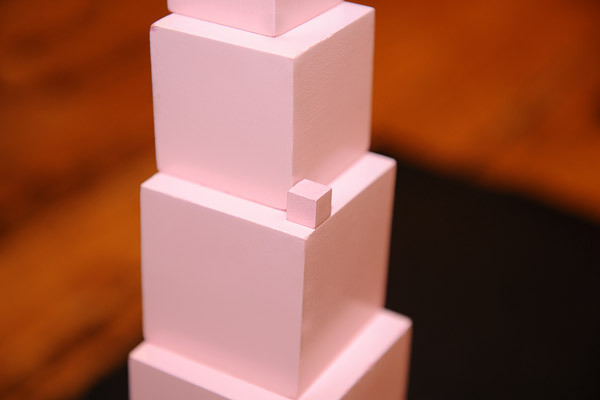 The step-by-step procedure in a presentation, helps children indirectly gain the ability to sequence. Again, another pre-requisite for reading. They are also gaining the ability to concentrate. Through their work with the sensorial materials, they gain the ability to compare and contrast their sensorial impressions. They hone their visual discrimination skills, required to discriminate between the shapes of letters for reading. Then there are the ‘sound games’ or ‘oral phonetic analysis’. A simple game played with the youngest children where they practice recognising individual sounds in a word. They are able to pick out beginning sounds, ending sounds, middle sounds and finally sequence all the individual sounds in a word. Through these games, they discover that words are made of individual sounds and enjoy picking out sounds in the words that they encounter in their daily lives. Children are introduced to the sandpaper letters where they trace the letters over and over again. Through this they connect the squiggle to the sound it represents. They associate sound with symbol. Indirectly they are building a motor memory of the symbol for writing, which will come later. And then there is the moveable alphabet. A child builds words with cut outs of the letters of the alphabet. They carefully sound out the individual sounds of the word they wish to build and then identify the corresponding symbol and place them in sequence on their mat. Can they read what they have built at this time? No, not yet, but this too is an important step towards reading which is yet to come. With exposure to all of this, by and large most children, tie these different strands together and voila! you have reading – reading, as a point of arrival! All too often children get mixed messages about nature. On one hand adults romanticise nature to children and expound liberally about how important it is to ‘save’ mother earth and we wax lyrical about the beauty of nature. On the other hand we all too often prohibit them from playing in the rain and slush, use the word ‘dirt’ synonymously for ‘soil’ and cringe when we chance upon a ‘bug’ or worm or ‘creepy-crawly’. When a young child instinctively bends down to pick up a tiny creature she comes across we hasten to get it out of their hands! The fact is children come unconditioned about the creatures they share this planet with and slowly take on the prevailing attitudes of those around them. This is an important evolutionary step. It is how we learn about our world from the experiences of others. We learn what to stay away from and what to seek. In times long past it was the line between life and death itself! A parent who delights in the simplest things of nature usually has a child who delights in nature too. I have a young friend, just past 3 years who LOVES ‘bugs’. She enjoys looking at them, handling them and talking about them. They make her world interesting and magical. You don’t have to look far to find out where this fascination comes from. You just have to meet her mother! Upon hearing the word, ‘worms’ most people cringe, right? Walk into school and you will find an entirely different mind set when it comes to earthworms! They inspire awe and the children are truly fascinated by them. 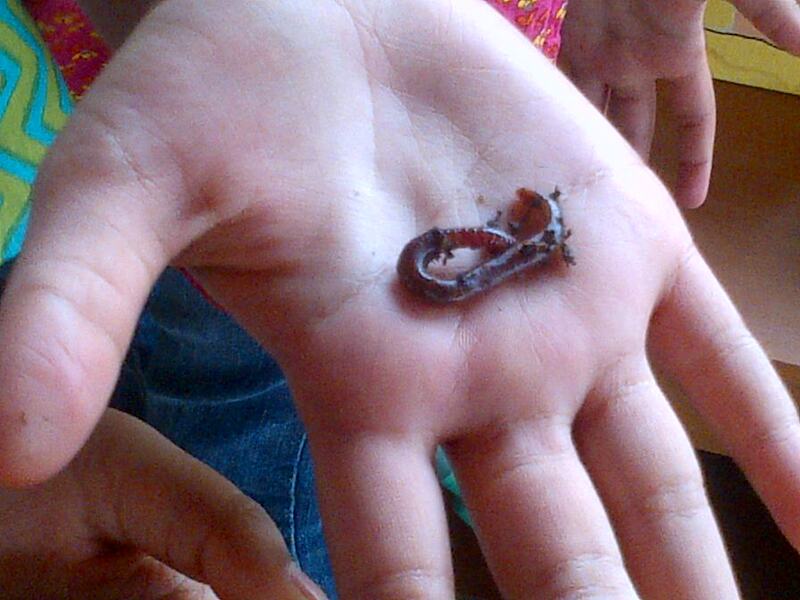 The child who has found an earthworm wriggling about on a cloudy, rainy day, feels s/he has chanced upon true treasure. The internal anatomy of the earthworm has been sewn onto cloth and made into soft toys with the shiniest beads used to denote their 5 hearts. Clay models have been fashioned, poems have been written and thick books completed, paying homage to the earthworm. They are the ‘new’ super heroes at school. I recently gave the first great lesson – the story of the universe to the elementary children. This is a period of great excitement, questions and ponderings for the children and well, for me too. I am always especially excited for the children who are hearing this epic tale for the first time. An entire universe is unlocked and ready for their explorations. The entire Montessori ‘curriculum’ during the elementary years is dubbed as ‘Cosmic Education’. Cosmic Education connects all players in the Cosmic Drama, both animate, as well as inanimate. It is an opportunity for the child to unify themselves with the very cosmos! Lofty ideals these, but Montessori is ALL about lofty ideals. The primary aged child has the gift of developing a ‘unified self’, the elementary aged child has the gift of ‘unifying with the cosmos’ and the adolescent, ‘unifying with ones fellow beings’. Each and every year I see these stupendous ideals fleshed out into practical experiences that guide the children on their path. This year, soon after I presented the story of the universe to the children I saw the movie ‘Agora‘. It’s the fictionalised story of the life of Hypatia– the Alexandrian mathematician and philosopher who lived during the 4th century CE. Living through times of religious strife, Hypatia managed to hold on to her beliefs and till the very end dedicate her life to probing the secrets of the universe. At a time when the mere thought that the workings of the cosmos was anything less of pure perfection was considered heresy, Hypatia anticipated that the earth went around the sun in an elliptical orbit. Now an ellipse was considered an ‘impure’ shape – a base figure as compared to the ‘perfect’ circle, where the centre is constantly equidistant from its diameter. Hypatia was a woman far beyond her times. While viewing the movie (which had it’s good and bad points, but this is not a film review) I couldn’t help but see a parallel between Hypatia and the elementary child. Both probe the secrets of the cosmos and ‘touch’ it with their gift of imagination, are sensitive to issues of fairness, cannot help but ask BIG, philosophical questions and attempt to find answers guided by their reasoning mind. I often meet adults who have completely lost touch with the child they once were. Philosophical questions, the awesomeness of the universe and all the many splendours out there, leave them unmoved while they plod along life’s path miserable in their day-to-day existence. My hope is that children who have received cosmic education will, no matter how old they get, always have the child they once were alive in them. No matter what difficulties life throws in their path, and there surely will be many challenges, they will never cease to feel wonder at this truly majestic universe that we inhabit, never cease to ask questions bigger than themselves and never fear to look for answers. In short, my hope is that the Cosmic Education they receive will last them a lifetime. Having made several visits to various Montessori material manufacturers over the last month, I have noticed a marked increase in the range of ‘supplementary’ material that is on offer. Most of these materials are inessential, silly baubles that serve to detract rather than enrich the child’s work. Moreover, they seem to be carelessly made, using uninspiring material. Often times they also convey misleading information. In addition to the ‘supplementary’ material, there are a host of materials that were previously hand made by the teacher – reading material, nomenclature cards, math charts and so on. Though the store bought materials are ‘shiny’ and so much more convenient for the adult, I couldn’t help but observe that the connection between the hand and the material had been instantly severed. The teacher made material is a slow cooked meal, while the store bought materials are fast food! From what little I know of market economics, there is obviously a demand for this supply, which I have observed steadily increase over the last few years. Take it one logical step further and it means that there are many Montessori schools out there that are placing these materials on their shelves and having children work with them. I am a Montessori purist. I haven’t always been this way, but as my understanding of the child and the method grew and as I gained more experience, I found myself becoming more and more of a purist. The open ended nature of the material and the connections between them are so cohesive that it is only rarely that I find the need to ‘create’ a material. When this happens it is usually in response to an individual child or children rather than to the whole group. These materials rarely, if ever, stay on the shelf through the year. Again, these materials are more often for the elementary aged child. 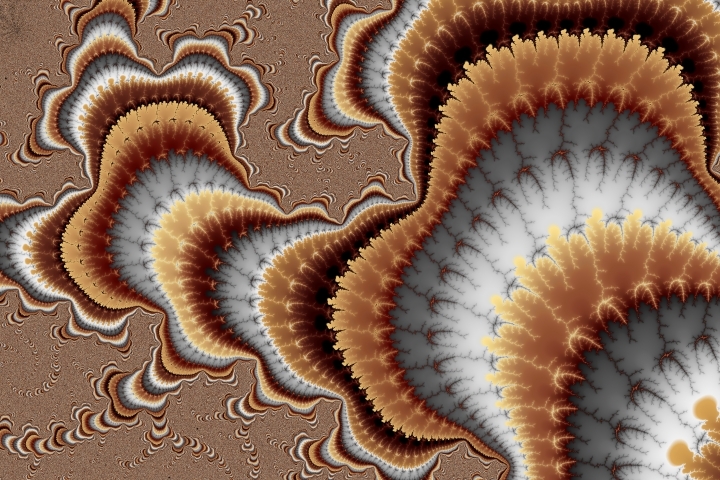 This is not to say that the method and our understanding does not change. Of course it does and should. Montessori always said that her work had come only so far and it is was now for the others to take it forward. And I believe it has changed. These changes however need to be guided by the deeper principles of child development and need to be well thought out, improvements. Every material that is added has the potential to take away from another. Also, as Barry Schwartz discovered a complete lack of choice leads to demotivation and reduced involvement, while on the other hand, excessive choice serves to decrease satisfaction and happiness. Here is an article by Angeline Lillard, “How important Are Montessori Materials” that reflects on staying true to the original Montessori material vs adding supplementary materials into the classroom. Excessive quantity of the educative material; may dissipate the attention, render the exercises with the objects mechanical and cause the child to pass by his psychological moment o f ascent without perceiving it and seizing it. … such objects are then futile. Over-abundance debilitates and retards progress; this has been proved again and again by my collaborators. Why Is The Giraffe In A Box? Missy is a little over two and a half years. The world is brand new and magnificent! A walk in the neighbourhood holds endless adventure and she is curious about everything she encounters. She loves ants and can spend considerable time observing them. She throws down crumbs from her snack box hoping she will get a chance to see them carrying the crumbs in one long row. Caterpillars too hold special fascination for Missy, as do cows (India has plenty of these gentle creatures on her roads), dogs, butterflies, beetles, squirrels, birds, cockroaches (yes, you heard right, cockroaches!) and every other animal that we co-exist with in our urban environments. Yes, Missy’s world is a fascinating place. Television, the i-pad, the computer and other varieties of screen time are not a part of Missy’s life. But sometimes Missy encounters these. Recently she was visiting one of her relatives who was watching a ‘childrens’ movie on television. Missy was riveted to the screen – singing, talking animals!!! Who Knew? But if this was it, I wouldn’t be writing about a giraffe in a box, now would I? Missy was referring to the snatches of the movie she caught that morning – a giraffe was in a box and was being forced out with repeated prods from a log! It was supposed to be a slapstick and humorous scene, mind you – but to Missy it was the stuff of nightmares. How was she to process what she saw? It was terrifying and sad. Here’s another conversation with a child who just turned three. We shall call her Miss B. There are a million and one excellent reasons why young children should not have any screen time. For this post I will stick to just ONE. Aptly highlighted by the above anecdotes, young children have a difficult time distinguishing the real from the not real, fact from fiction, reality from fantasy. They have found themselves on a brand new planet. From experiences in their environment they make generalizations about how things work and transfer these to their everyday life. What our young are doing is building their ‘road map’ to navigate their surroundings. Nature helps them by ensuring their brains are wired in a way that they can go about their great work . Their great work can only be done through active exploration of their environment. Through this exploration the child will ‘incarnate’ their environment. Big word – incarnate. But, that is exactly what young children are doing everywhere in the world. Television and other forms of screen time, are too abstract and confusing for the young child. Not only is the child a passive viewer, but television often provides an inaccurate and counter productive picture of reality and the child uses this as their raw material to navigate their world! Fears and unrealistic ideas of cause and effect are served up to the young child through television and other forms of screen time. Added to this is the fact that the images and sounds children encounter on television, the computer and other forms of electronic devices, do not stop when the button is switched off. They continue to ‘play’ in the child’s mind. Montessori called this ‘flight’. The child is physically present but mentally is in some ‘f-a-a-a-r off’ place. Flight further distances the child from her present, here-and-now, environment. Everywhere I go I see tiny mites, some still in diapers and prams, fiddling with phones, I-pads and other electronic devices. Often I see adults push these gadgets into their child’s hands so that they may continue with a conversation. At restaurants I constantly observe children with a screen in their hands. The immediate environment instantly recedes. There are no people, no objects, no voices, no activity – just finger poking and swiping and beeps and twangs. Screen time places hurdle after hurdle for the young child. Like I said in an earlier post, Urban India needs to wake up, turn their television sets off, put their computers to sleep and take their children out for a walk ! A school as an institution has its own path of development. Just like the child and the teacher, a school too has developmental stages. From the very onset, we were mindful that the many choices we made in our initial years, would create the story of our school; Being the foundation from which our school grew it would impact the path of the school in the many years yet to come. Reflecting back over the academic year just passed, I have come to realise that we at The Earth School are entering a new phase of development! Pondering further on this, I couldn’t help but liken schools development to the stages of development of children. Indulge me, dear readers, if you have the time and inclination, to explore this thought further. Today, we are gradually leaving our years of ‘creation’ – of infancy and toddlerhood and entering a phase of consolidation – the childhood years. We are much like the 6-year-old child, straddling two planes of development. The first years of The Earth School was a heady mixture of unrestrained enthusiasm and optimism – even through the miscalculations and setbacks that are inevitable during the initial years of an institution. With the Montessori pedagogy as our guide, we were creating something that simply did not exist before. We were pure ‘potential’. Each experience carried with it ‘new’ learning and there was much exploration. Slowly, we formed a base for our understanding of the various aspects of a school. These initial years were prone to many ups and downs. There was some instability due to the fact that everything was so nascent. Through these years help always poured in from family and friends in a myriad of forms. They understood our passion and had witnessed us work toward the dream of The Earth School. For the first time last academic year, we found the ‘umbilical cord’ cut. We felt it the most when two of our dear friends and colleagues left us to pursue other dreams. It was a time of some insecurity for us. In retrospect, these changes came at the right time. We had grown enough to sustain ourselves – we now had the resilience for the many ‘reality checks’ that the year was to bring. It gave us the preparation to step into the next stage of growth. Over the last year, without us realising it, we have changed ever so subtly. Our understanding of people and human nature has grown. Our understanding of the child has strengthened. We are able to ‘see’ the developmental continuum of the child more clearly. We have come to be more accepting of ourselves and of each other. We have grown in confidence and born out of this we have started looking more outward, just like the elementary aged child. We have started actively building a more involved larger community. Having had the confidence to open ourselves up, we have been blessed with a supportive and insightful parent body, who have taken our hand to walk along with us. Now each active member is colouring and shaping the path of our school. Though the bigger picture of our work has always been in the forefront, I find us asking larger questions more frequently. We have started asking more questions regarding our role in a larger community as well. Today, even our small, seemingly inconsequential actions, sets us thinking about the ‘bigger’ picture. The similarity with the elementary child is hard to miss here! We have barely begun our journey. I do not know what tests await us in the future, what learning’s are in store for us. There is much to do and more to build and a long, long path to walk on. We do a lot of hand work at school. There’s woodworking, sewing, finger knitting, fish braiding (initiated by one of the children who also likes the privilege of being the one to present it to the others), weaving, crocheting and more recently, following paper patterns to make soft toys. 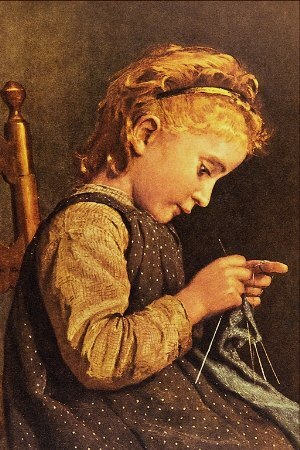 This year I plan to introduce children to knitting. Ideally, I would like to show them how to make their own wooden/bamboo knitting needles. It would call upon some of the wood working skills they have already gained and I am sure they will love the process of making the needles. It is important to sow the seeds of a great many things in the elementary years. Children are still enthusiastic and willing to try their hand at all manner of ‘new’ pursuits. In the developmental stage that is to follow – the adolescent years, one sees this spirit decline. Instead adolescents want to ‘create’. What they do not want, is to start working from scratch on the skills they need to bring to life what they are imagining. If the skills have already been gained then they will use them and express themselves through their creations. This need for self-expression has resulted in substantial blocks of time being put aside for creative and self expression during the erdkinder years. Work with our hands is important at every age.